In order to establish the Warlander bloodline, these breeding standards are defined by the IWSR. 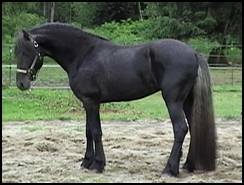 Iberian: refers to horses registered and recognized as Pura Raza EspaC1ola (Andalusian) or Lusitano, or the registered and recognized cross of these two breeds (Pure Spanish Portuguese) bloodlines. 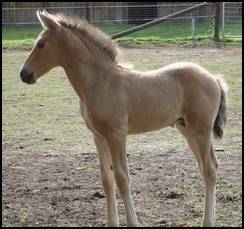 It has been proven through DNA testing that these horses are of original Iberian bloodlines. Iberians must be DNA tested and registered by an established registry that is recognized by IWSR. 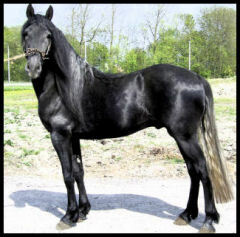 Friesian: refers to horses registered and recognized as pure Friesian, with either of the American registries Friesian Horse Association of North America (FHANA), or the FPZV USA, or their European parent registries, the Friese Paarden Stamboek (FPS) and the Friesenpferde-Zuchtverband e. V. (FPZV) respectively. 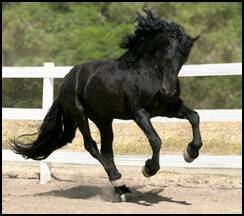 Warlander: Warlanders are derived from the crossbreeding of Friesian and Iberian purebred horses. The Warlander must not be more than 3/4 - (75%), nor less than 1/4 - (25%), of either of these two base breeds. No other breed influence is permitted. 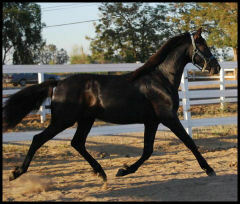 Warlanders may be bred to eligible Warlander, Friesian, and Iberian lines so long as the above criteria is maintained. Height: Warlanders must be no less than 14.3 hands (1.50m) at the withers by age four. No taller than 16.2 hands is preferable, up to 17 hands will be allowed if all other conformation criteria are met. 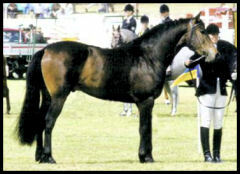 The Registry strongly encourages breeders to breed for a height no larger than 16.2 in an effort to maintain the Warlander as a baroque type horse. Color: All solid coat colors are permitted. 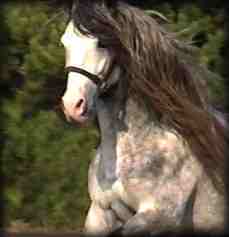 Roaning, Pinto, or Appaloosa, markings are not permitted. White markings are allowed below the knee. White facial markings are allowed. The Head: The head is carried upright and shows the stamp of nobility. The profile is straight or slightly convex. The forehead is deep with the eyes set well below the ears. The face should be lean and smooth ending in a long, narrow nostril with the inverted comma shape. Lips should be firm and tactile. Ears are curved with a slightly inverted tip. The Eye: The eye should be of a triangular shape, large and set well apart. They should be alert yet soft, with an air of intelligence. The Neck: The neck is well-muscled and high arched, springing from the shoulder, and narrowing toward the head with a fine clean throatlatch. The mane should be abundant with thick luxurious hair that is neither coarse nor overly fine. The Shoulder and Topline: The topline of the Warlander should give the impression of grace and elegance. It flows smoothly from the poll in a graceful curve down the neck to slightly set back well rounded withers. 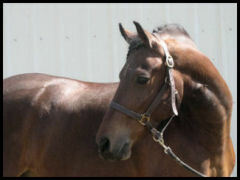 The back is straight and strong flowing from the withers in a straight line to a well rounded croup. The overall look should be a smooth line that flows gracefully. The shoulder is well sloping, long, and muscular with a 50 degree angle. Legs: Legs should have solid bone, without being overly heavy. they must be set well at each corner of the body, in a naturally square position. Legs should point forward without deviation. The pastern should be well let down (45 degrees) and not be too short or too long. The cannon bone should be clean, rounded in front, broad and flat on the sides, with substance denoting a horse of saddle horse breeding. The knee is broad, flat and correctly placed in the vertical line of the leg. The forearm should be well muscled and long in proportion to the cannon. 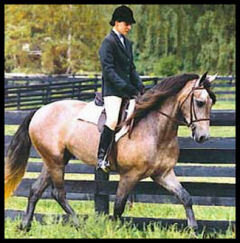 The hind legs should be straight and well muscled at the gaskin. The hock should be clean and free from blemish. 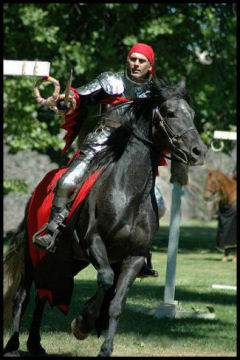 Overall Impression: The Warlander is a balanced, smooth, strong coupled horse, bred for riding. It is a versatile mount capable of higher level riding disciplines. Warlanders should convey the impression of both functionality and beauty. The Warlander is a horse of Harmony, carrying itself with impulsion and grace, its movement should be floating and effortless, with natural suspension and drive. It is easily capable of collection, as its conformation and breeding are focused on the ability to do so. The temperament is docile and willing with a natural intelligence that when training gives the impression the Warlander is being reminded of a deep knowledge it already has. They are calm and accepting of new situations with an "old soul" attitude that is a pleasure to work with.